WASHINGTON — President Donald Trump and his White House have spent the last several weeks caught up in staff shake-ups, infighting, more revelations about Russia investigations and the response to the nation's latest mass school shooting. Vice President Mike Pence, on the other hand, spent a good part of that same time traveling to states like Michigan, Tennessee and Texas, raising money for Republican candidates up and down the ballot in advance of this fall's midterm elections and selling the party's achievements in Washington, especially on taxes. It's just the beginning of an ambitious calendar of events Pence has sketched out in the next three months, revealing a traditional political approach for a key member of a decidedly unorthodox presidency. By the end of April, the vice president will have headlined 30 political events, according to his calendar, a schedule Republicans believe will be critical to helping them protect their congressional majorities in November at a time when many are predicting a Democratic wave. On Friday, Pence visited Detroit for a tax policy event and political fundraiser, and next week he will travel to Iowa, Kentucky and Nebraska. 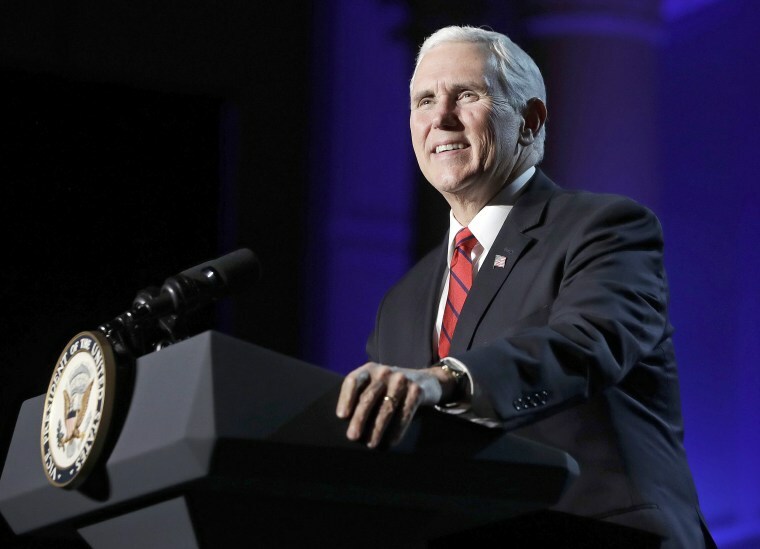 Pence's ambitious early 2018 effort was sketched out during a January meeting at Camp David with the president, House Speaker Paul Ryan, R-Wis., and Senate Majority Leader Mitch McConnell, R-Ky.
"Everyone agreed that the vice president has a key role to play in this process — the tip of the spear, so to speak," said Marty Obst, a longtime Pence adviser who heads the Great America Committee, a leadership PAC formed last year primarily to cover the costs of Pence's political travels. And while the attention in Washington remains fixed elsewhere, Pence has begun focusing the party's campaign message on touting the administration's successes, including the signing of the major tax reform measure at the end of 2017. "Promises made, promises kept," Pence said last Tuesday in a speech to the National Religious Broadcasters convention in Nashville, promoting an agenda that, he says, has resulted in an America that is "more secure and booming." "Under President Trump, strength is back, jobs are coming back. In a word, America is coming back," Pence told the National Religious Broadcasters convention. "The past year has been a year of action — a year of remarkable results." And the vice president is just getting started. Later this month, his stops will include North Dakota, on behalf of Republican Senate candidate Kevin Cramer. Then, on to Nevada in April for Sen. Dean Heller's re-election bid, as well as to Missouri for Senate candidate Josh Hawley. He will also visit Nebraska and New Hampshire to stump for the re-election of Govs. Pete Ricketts and Chris Sununu. "Many politicians are good at bonding but not good at the ask," Doug Deason, a Dallas investor and prominent Trump donor who is part of the Koch brothers network, said of Pence's pitch for donations. "Mike is just extremely gregarious and a straight shooter. He’s a Godly man — everything we stand for as conservatives. It's huge for the party." Two weeks ago, Pence visited the Dallas home of Deason's father, Darwin Deason, a billionaire businessman who hosted a luncheon with 14 big donors that resulted in several million dollars in donations for America First Action, a pro-Trump super PAC. Later that night at a Dallas hotel, Pence headlined his first fundraiser for Protect the House, a new campaign fund that aids Pence's PAC, along with House Majority Leader Kevin McCarthy's super PAC, the National Republican Congressional Committee (NRCC), and 22 vulnerable Republican House members that the party hopes to help ahead of the election. The Dallas fundraiser hauled in $800,000 that will help, in part, the likes of Rep. Will Hurd of Texas, who attended the event and is one of the vulnerable Republicans. The vice president is packing plenty into his trips out of Washington. On Tuesday in Tennessee, for example, in addition to his speech to broadcasters, Pence addresed the Susan B. Anthony List, an organization with a super PAC arm that provides financial backing to anti-abortion candidates, and attended a fundraiser for the Republican Governors Association at Gov. Bill Haslam's residence. Pence has already proved to be one of the most effective rainmakers since taking office. He led a fundraising swing through California in October that his allies intend to build on in other states this spring. Over the course of 48 hours in the state, Pence raised $5 million — funds that were divvied up between his leadership PAC, the NRCC and each California Republican congressional member. "Vice presidents and presidents have always come to California to raise money, but this is the first time I remember a vice president starting in one end of the state and going breakfast, lunch and dinner up and down the state and raising that kind of money for our party," said Jim Brulte, the chairman of the California Republican Party. Pence also campaigned in February for Rick Saccone ahead of a special election in Pennsylvania's 18th Congressional District on March 13 and raised $225,000 on the candidate's behalf. In Michigan on Friday, Pence headlined an event hosted by America First Policies — his third such event for the organization— before leading another Protect the House fundraiser, which will help, in part, Rep. Mike Bishop, of Rochester, Michigan, another vulnerable Republicans to benefit from the fund. Pence's PAC is also evaluating primaries in competitive congressional seats being vacated by Republican members. Obst insisted there are "no lost causes" in November, including the tough districts that Hillary Clinton carried in 2016. "We think that talk of the wave election is premature," Obst asserted. Pence's efforts will be aided by other political campaign arms, including the NRCC and outside groups like the Congressional Leadership Fund, a Paul Ryan-backed super PAC that has already opened campaign field offices in 27 congressional districts to assist the candidates' efforts. But the vice president is at the center of the party’s 2018 campaign efforts, knowing all too well that midterm elections often do not fair well for the party in power. "We threw out the playbook in 2016, and we're going to throw it out in 2018," Pence promised to more than 1,500 Republican activists last month at the Dallas County GOP’s Reagan Day Dinner. And thus far, he is leading the party's efforts at following that very playbook.